Old Clockworks is the third of the mansions that Luigi visits in Luigi's Mansion: Dark Moon. 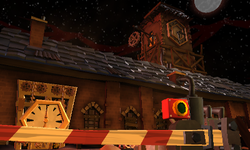 E. Gadd tells him that a Dark Moon piece is in the highest point of the clocktower. E. Gadd tells Luigi it closed shortly after opening due to some horrific accidents. As its name indicates, this 'mansion' is fairly clockwork themed, featuring various mechanical rooms. It is also somewhat of a desert theme, as its location features a lot of sand, as does the mansion itself. This is where Luigi can find a yellow Toad Assistant. It is also shown here several Boos save the Toad from a long fall, before sticking him in a painting. The Old Clockworks originally produced, according to E. Gadd, the finest watches and clocks long ago. The factory itself is the oldest of the mansions as it is the Evershade Valley's ghosts favorite haunt. The factory was built on top of some ruins. The owners of the clockworks seemed interested in this as mining and excavation equipment can be found strewn about the ruins. There is also a stairway leading from the factory into the ruins. It is unknown why it closed down, but several jackets, coats and hats can be found still on racks, and the large amount of equipment and crates left behind, suggests something happened within the factory itself to cause it to be abandoned. This factory once produced the world's finest clocks and time-measurement devices. Your watch probably comes from here, and you don't even know it! C-1 A Timely Entrance Good news, Luigi. I've located the next Dark Moon piece. It's at the top of the Clock Tower. All you've gotta do is mosey on up there and grab it! What could go wrong? Underground Trek The special compass revealed another path to the underground! Let's hope those ghosts didn't hide the clock hands too well. C-3 Roundhouse Brawl That ancient ghost ran off with the clock hands we're looking for. Thankfully, his strong paranormal signal made him easy to find! Ghosty in the Middle Well, we've recovered the minute hand, but the hour hand is still missing. I've detected some signals in the Clockworks Court, so let's start our search there. C-5 Piece at Last There's one last clock part we need to find before we can fix the Clock Tower Gate, and I think I know where it is! Show Time We finally have everything we need to reach the top of the Clock Tower! But first, let's check the security image that the Toad brought with him. Outlandish Interruption We've got a complication. There are paranormal signals in the Old Clockworks again! It's ghost-hunting time, sonny! Balls of ribbon in the Warehouse that can be unraveled by a machine, containing items. One of these holds a Key. Old Clockworks Music - The song that plays in Old Clockworks. Outlandish Interruption Music - The song that plays during Outlandish Interruption. jigōkurokku kōjō Jigoklock Factory; a pun on 地獄 jigoku, meaning "Hell". French Pendularium Latin word for "Pendulum Clock"
This page was last edited on July 26, 2018, at 16:50.